A high degree of dimen­sional stabil­ity is often required for aircraft and space­craft compon­ents. In order to eval­u­ate mater­i­als for aero­nautic and aerospace applic­a­tions the Coefficients of Thermal Expansion (CTE) and the Coefficient of Moisture Expansion (CME) have to be determ­ined. Especially in case of fibre rein­forced poly­mer compos­ites, the common dilato­met­ers suffer from limited resol­u­tion. Therefore, this special device was developed and is able to meas­ure expan­sions with high accur­acy combined with long term stabil­ity. with initial length l0, initial mass m0, time depend­ent length Δl and mass vari­ation Δm. The length vari­ation is determ­ined by two laser micro-inter­fer­o­met­ers, one focused to the front and one to the rear end of the sample. The maximum sample size is 300mm x 30mm. However, other than rect­an­gu­lar geomet­ries (e.g. tubes) can be taken into consid­er­a­tion. In any case with the avail­able space the expec­ted CME values of advanced compos­ites can be determ­ined. The complete system is oper­ated in vacuum (<10-3 Pa ) and is moun­ted on one support frame. This support is also part of a vibra­tion isol­a­tion required for the inter­fer­o­met­ers. The meas­ure­ment of length is based on micro-inter­fer­ences of the light of the lasers (yellow). A small mirror is fixed on the speci­men (red, approx­im­ately 220 mm long). The speci­men is located in thermal vacuum envir­on­ment (see image below: stain­less cham­ber). 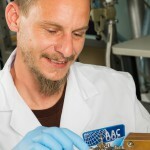 Micro-inter­fer­o­met­ers are thermally separ­ated, but in the same vacuum cham­ber. A closed copper cylin­der contains the sample holder and can be oper­ated in the range of RT up to 70°C. The heating/cooling system consists of a fluid pipe and a heat­ing wire. Thermal expan­sion effects are addi­tion­ally minim­ized due to the use of low CTE mater­i­als like glass ceramic and Invar. The laser sensors are moun­ted in the same vacuum cham­ber but they are thermally shiel­ded. Furthermore the lasers are temper­at­ure stabil­ized by a seper­ate cool­ing system which is oper­ated by a fluid ther­mo­stat at about 22°C. For calcu­la­tion of the Coefficient of Moisture Expansion (CME) an Advanced Outgassing Test has to be added, using the identical thermal vacuum.